Situated on the southwest coast, nine miles (14km) west of vibrant Puerto Rico, Puerto Mogan is one of the more up-market holiday resorts on Gran Canaria. The town is an old fishing village that has recently started to be developed into a modern resort town but retains an authentic Spanish charm. 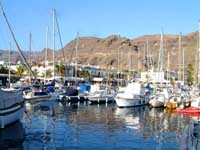 Tourism is centred around the marina which bustles with local boats, yachts and Atlantic cruisers. There are a selection of bars, shops and restaurants aimed at tourists, but the shops are less tacky than in some neighbouring resorts and the restaurants serve some of the best seafood on the island. Backed by the mountains, the picturesque old Puerto Mogan village is a maze of narrow roads and colonial style houses; the couple of canals running through the town has prompted tour operators to dub it 'Little Venice'. There is one small beach in the resort and another, Playa Taurito, three miles (5km) to the east; both have black volcanic sand and boulders. Although there is a disco or two in Puerto Mogan, those looking for a more energetic nightlife should head to Puerto Rico or Playa del Inglés. Puerto Mogan has all the shops that you would expect from a holiday resort in the Canary Islands, but they are generally a little more arty-crafty and sell less of the rubbish that you usually find in souvenir shops; there is less quantity and more quality in Puerto Mogan than at many other resorts. Every Friday morning there is a large market in town, which is aimed at locals as well as tourists and sells everything from fresh fish to football shirts. While there is no shortage of fast food stalls and restaurants offering full English breakfasts in Puerto Mogan there are also a few restaurants offering good Canarian cuisine, wines and cheeses. Puerto Mogan is best known for its excellent seafood restaurants serving locally caught fish. Some top choices include Restaurante El Castillo for paella or tapas, La Bodeguilla Juanana for great Canarian cuisine, and Casito Mediterraneo for some of the freshest fish in town. Most restaurants are located around the harbour. While there is a disco or two and many restaurants offer some sort of entertainment, most visitors come to Puerto Morgan on holiday for peace and relaxation. The nightlife is limited and sedate and those in search of a party will need to travel to a more energetic resort. Sailing, jetskiing, boat tours, fishing trips and jeep safaris can be organised from Puerto Mogan. It is also one of the best scuba diving destinations on the island, with two wrecks just in front of the harbour and the Mogan Caves about a mile away where divers and snorkelers can expect to see large shoals of fish, moray eels, barracudas and yellow grunters. Non-divers on holiday can take a fascinating submarine trip to discover this underwater world. The actual village of Mogan is about six miles (10km) inland and is well worth a visit; it retains a strong rural Spanish ambience and is home to some good traditional Canarian restaurants. Visitors should be aware that there is some building work going on in Puerto Mogan, but this is mostly towards the back of the resort; it is worth checking that there is no building site near your accommodation. Those looking for large nightclubs and dance music will need to make the short trip to Playa del Ingles.